BrightRoll is releasing a new dashboard called BrightRoll insights, aimed at giving advertisers a better view into how their programmatic campaigns are performing. BrightRoll insights will allow users to pick from a slate of metrics, allowing them to dig into their impressions, conversions, media cost, and so on. 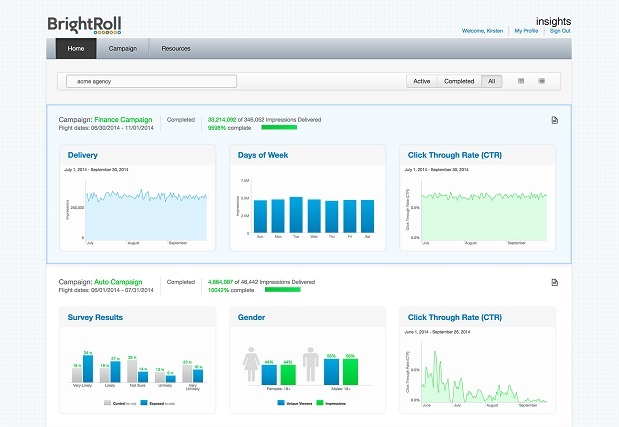 The dashboard uses a drag-and-drop interface, meaning marketers won’t have to code to be able to use it. Acquired by Yahoo in November 2014, BrightRoll provides a platform for video advertising and programmatic ad buying, a method of purchasing targeting ad slots that involves bidding on them in real-time. Programmatic has been taking off for some time now, and after listening to its customers, BrightRoll decided to release the insights dashboard as a way for them to measure ROI using their own metrics, said Guy Yalif, vice-president of global marketing for BrightRoll. Screenshot of the BrightRoll insights dashboard. (Image: BrightRoll). “We asked them, what are your goals, and how do you measure the success of your programmatic video investments?” he said, adding that customers from BrightRoll’s beta testing group provided input on the metrics they wanted to see in the dashboard. For example, one of the key features of BrightRoll insights is the ability to track conversations through social media. Marketers can see how their video campaigns are performing and how often they’re being shared or posted on social media. That makes it easier for them to respond to consumers in real time, or to tweak and amplify their messages as needed. Alongside tracking campaigns through social channels, the dashboard also helps marketers target the right audiences for their ads using the web and mobile, mapping frequency, unique viewers, gross rating points, and the demographics of their audiences thanks to data from comScore and Nielsen. But one of the most interesting tools in the new dashboard is the ability for marketers to now run surveys alongside their content, Yalif said. Surveys can be run through either BrightRoll or a third-party, helping marketers figure out whether consumers have become more aware of their brands, and what their perceptions might be. He added surveys can be sent to consumers who saw a particular ad, as well as to those who didn’t, allowing marketers to get a good handle on how a specific ad performed. BrightRoll insights also allows marketers to tap into custom research, showing them consumers’ offline purchase behaviour, online behaviour, or results from a long-form survey campaign, helping them get a better sense of the effectiveness of their campaigns. The dashboard is now generally available worldwide, and does not cost anything extra for BrightRoll’s current customers.